Here is update of Airtel offer on valentine day. Now on the 7th, 14th and 21st February, 2010 all calls from your Airtel Fixed Line to all Airtel Fixed Lines will be absolutley free all across India. 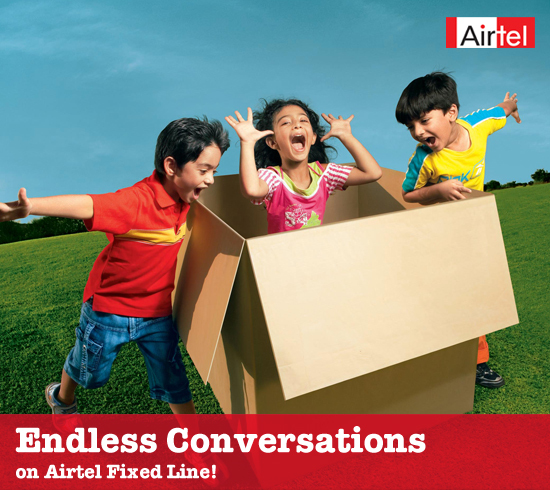 So go ahead, enjoy those endless conversations with your precious ones. This great Airtel offer is already activated on your fixed line connection you at no extra cost. You don’t need to call customer care for activation. However for conformation you can call Airtel customer care at 121 from your Airtel fixed line. Earlier, Airtel announced that the great offer is valid only on 14th Feb 2010. I just received mail from Airtel with new update. You can also read about the offer on Airtel website here. So, start enjoying from next sunday. I’m a big fan of this website and I read it regularly. Keep up the excellent work!